2-1 hockey games are boring right? Wrong! In arguably the most emotionally charged game of the season, the Kelowna Rockets were able to earn a one goal win last night over the Kamloops Blazers. The two points didn't come easy. Hard fought, rewarding victories that galvanize a team never are a walk in the park. The home team had to answer the bell or cower to a Blazers team that wanted to up the ante - physically. That should have come as no surprise after playing a significantly gentler game the night prior in a 3-2 overtime win in Kamloops. What came as a surprise was the Rockets ability to answer the bell. Instead of folding like a cheap tent, the home team appeared to play with more bite and gave back as much as they received in their 17th win of the season. With a capacity crowd (6,007) watching things unfold between the two BC Division rivals, it proved that even a game in late December can bring the type of energy, emotion and intensity that makes the game so fun to watch. Sadly, pure, raw emotion is often lost in a gentler game where skating and skill are the focal point and animosity towards one another is an afterthought. That wasn't the case on this night. The turning point? In my humble opinion it was a fight that Rockets defenceman Dalton Gally had with Blazer overager Jeff Faith. It happened after Faith delivered a hard hit on Nolan Foote. Foote was targeted twice with big hits before Gally elected to drop the gloves with Faith, sending a message that the home team wouldn't be pushed around. It seemed after that tilt, the Rockets played with more emotion. While not losing their heads and running around in an effort to get retribution, Adam Foote's team played with more passion and heart then what we've witnessed from this group this season. Typically, goals were hard to come by for both teams. Dylan Ferguson and Roman Basran had much to do with that as both goalies were named game stars. Of the three goals I liked the most, it was likely the goal mouth scramble when Nolan Foote was able to knock the puck in from the lip of the crease. It was as ugly of a goal as Foote will score, but it was the type of greasy goal that only seemed fitting in a game where heart and determination, not skill, would be the deciding factor between a win and a loss. It was Foote's 19th of the season, tying a career high for goals that was set in his rookie campaign. The goal tied the game at 1. The prettiest goal of the night came from leading scorer Kyle Topping. The 19 year-old received a picture perfect pass from the right point by teammate Lassi Thomson. Thomson, locating Topping at the left face-off circle, fired a perfect shot, short-side blocker-side, to give the home team their first lead of the game. From there, the Rockets weren't about to surrender another heartbreaking late third period goal and ended up earning a point at Prospera Place for the 9th time in 10 games. While not receiving a star in the building, I thought Dalton Gally deserved one. If for only one night the big defenceman should have been recognized, this indeed was the game. The fight was one thing. The well spoken blueliner also had two assists and had a solid hit on Blazers forward Brodi Stuart in the third period. I was pleased to see he received some love after the game as he was made available to the media for his terrific effort. It may be a small detail, but I really thought the Rockets celebration after the two goals were scored had a different tone/feel to them. Everyone seemed to be a little more jacked up. Were the goals more rewarding? Were they playing harder for each other? Maybe the crowd had something to do with it? I can't pin point it, but clearly it looked like they were enjoying the fruits of their labour unlike what we've witnessed in the opening 36 games of the season. The Rockets have been involved in 10-one goal games this season on home ice. Of those 10, the Rockets have a record of 6-3-1-0. The win moves the Rockets back into sole possession of second place in the BC Division, two points up on the third place Victoria Royals. The Royals suffered a 4-2 loss in Medicine Hat. On a Central Division road trip, the Royals still have 5 games in hand, so the Rockets will have to watch things unfold this week before playing their next game on Friday against the visiting Prince George Cougars. Game Day Preview: Welcome to the unofficial second half of the WHL season for the Kelowna Rockets. This is technically game #36 (two games past the halfway point) and is the 5th consecutive game on opposition ice after completing a four game in five night Central Division road trip before Christmas. The Rockets enter the game with a record of 16-17-2-0, which is good for second place in the BC Division, 7 points up on the Blazers, who have 4 games in hand. This is only the third meeting of the season between these two teams. They met on the opening weekend of the season with the Blazers winning 4-1 and 3-1. The Rockets meet the Blazers in three of their next four games, with a return engagement tomorrow night at Prospera Place before meeting again at Sandman Centre January 5th. The Rockets are 0-2-0-0 in the seasonal series. The Rockets are coming off a 2-1 win in Medicine Hat back on December 16th. Leif Mattson scored both goals in the win, snapping a mini two game losing streak. The Rockets are 12-7-2-0 in 21 games under head coach Adam Foote. Who’s Hot: Nolan Foote has points in 6 of his last 8 games. Foote has 3+6=9 over that stretch...Leif Mattson has 8 goals in his last 11 games. The 19 year-old has registered at least one shot on goal in 34 of the teams 35 games this season. Kyle Topping has registered a point in 25 of the teams 35 games this season... The Rockets penalty killing unit is 30 for 32 in their last seven road games. Approaching Personal Bests: Liam Kindree is one point shy of the career high 27 points he put up last season. Kindree has 7+19=26 this season after accumulating 8+19=27 in 50 games a season ago…Nolan Foote is one goal shy of his career high 19 goals scored in his rookie season. Foote scored those 19 goals in 52 games…Half of Foote’s 50 career goals have been scored on the power play. 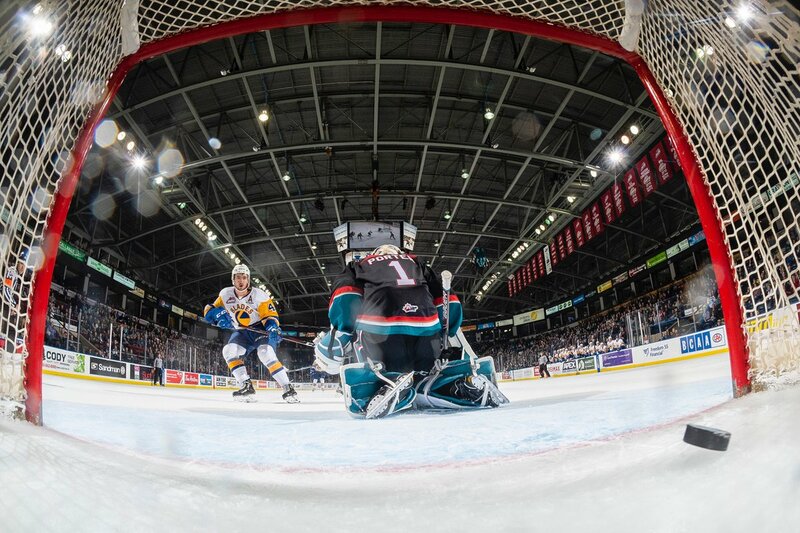 Broadcasters Notebook: Kyle Topping, Leif Mattson and Nolan Foote have combined to score 51% of the teams 92 goals this season….The Rockets are sending a CHL high three players to the CHL/NHL Top Prospects Game next month in Red Deer. Nolan Foote, Lassi Thomson and Kaedan Korczak will attend the game of the top 40 prospects. The game will take place January 23rd…Since going 1-8-0-0 to start the season, the team is 15-9-2-0 in their last 26 games….Kyle Topping’s next goal will be the 50th of his career…Leif Mattson has 5-two goal games this season. Four of those five-two goal games have come on the road…The Rockets have added 17 year-old forward Alex Swetlikoff to the roster. The Kelowna resident was acquired from the Lethbridge Hurricanes for a 4th round bantam pick. Swetlikoff was originally drafted in the third round by the Seattle Thunderbirds.…Lassi Thomson (Finland) and Libor Zabranski (Czech Republic) return to the lineup after failing to make their respective countries rosters for the World Junior Hockey Championships….The Rockets are 6-8-1-0 against BC Division teams this season….The Rockets have only one December birthday to celebrate. Lane Zablocki officially turned 20 yesterday (December 27th) …Four members of the Kelowna Rockets have been named to NHL Central Scouting’s November “Players to Watch’ List. Forward Nolan Foote is an ‘A’ prospect, meaning a first round candidate. Kaedan Korczak is a ‘B’ prospect which means he is a second or third round candidate. Roman Basran/Lassi Thomson are ‘C’ prospects, which means he could be taken in the third to the seventh round…Adam Foote was officially named the new head coach of the Kelowna Rockets on October 23, 2018 replacing Jason Smith.,,The Rockets are 4-8-1-0 when playing the second game of back-to-backs. 2 and 2. Yep, about what I expected on the Kelowna Rockets Central Division road trip before Christmas. Optimistically, I was looking for more, possibly a heroic effort in Lethbridge or Calgary that simply didn't come to fruition. I knew the toughest challenge would come in Lethbridge after spending the previous night in Cranbrook. Playing the night before and throwing a 3 and a half hour bus ride into the mix against a strong team puts you behind the eight ball awfully quick. But for a team that is teetering around the .500 mark this season, few find themselves in the middle of the pack of the 22 team circuit able to play four games in five nights and run the table. History has shown, only the championship caliber team's that have significant depth are able to defy the odds and prove that winning on the road is not a problem. I liked the way the Rockets ended the trip with a 2-1 victory in Medicine Hat. It has everyone feeling a little better about themselves heading into the Christmas break. While slow to start, the Rockets got a lucky one to take a 1-0 lead and then Leif Mattson scored a power play in the teams 16th win of the season. The officiating staff, who appeared through my 'Kelowna Rockets rose coloured glasses' of trying to keep it close, allowed the Tigers seven power play chances. Fortunately, assistant coach Kris Mallette's four man unit was again at its best in shutting the door. Heck, Roman Basran wasn't bad either with a 31 save performance and first star honors. The Rockets scored just 7 goals in the four games out East. That is concerning. That just isn't enough to win games. Sure, 5-1 losses in Lethbridge and Calgary saw the team allowed far too many goals against, but both games had little in the way of the opposition goaltender forced to be one of the best players on the ice. In all four games, the Rockets were unable to out-shoot the opposition. Against Kootenay (30-30), Lethbridge (37-27), Calgary (32-26) and Medicine Hat (32-20) the team couldn't lead on a clock that is often indicative of how much defending a team is doing as opposed to playing in the offensive zone. Leif Mattson ends the road trip with 4 goals. Sure, those four goals came in two games, but one of the teams offensive threats did produce. The luckiest goal he will ever score came in Medicine Hat when the Tigers pulled the goaltender on a delayed penalty and a back pass to the blue-line, in error, saw the puck slowly slid into the unprotected Tigers net. Nolan Foote was shut out in all four games while Kyle Topping had only one goal (in Kootenay) in the four games. With a 16-17-2-0 record, the team is about where I expected it to be at the halfway point of the season. I just didn't anticipate the team losing so many games early in the season, only to see a coaching change and the team responding to Adam Foote at the helm. I will admit under Foote, the team is playing more to its strengths than its weaknesses. It has been a significant change to the run and gun offense that allowed the team to win 43 games and raise a BC Division banner high into the rafters last season. But despite losing its top four point producers, I just didn't see the team changing the way they approached games. Maybe they were trying too, but it didn't visually look like they were trying to play more defensive until Foote took over. But don't blame Foote for wanting to play defensive hockey. Right now he needs his team to play that way in an effort to win. Sometimes statistics do lie. Look at Ethan Ernst's evolution as a player. I think the 16 year-old is doing exactly what Adam Foote wants him to do. The buy-in from a raw rookie is impressive. Ernst will spend the Christmas break wondering why he only has 1 goal this season. The fact is, his defending is superior to some veterans who have twice as many games under their belt at the WHL level. A trip like this provides so many highlites. I dislike the travel as we spend so little time sleeping in four different hotels over what can only be described as a chaotic schedule. That said, the people you meet along the way is the funniest part. Ok, that and winning. Meeting Kootenay Ice radio broadcaster Brant Hilton for the first time. Having some chuckles with Hurricanes radio man Dustin Forbes before game time, or talking shop with Jeff Hollick in Calgary. The people around the game makes it a fun experience. 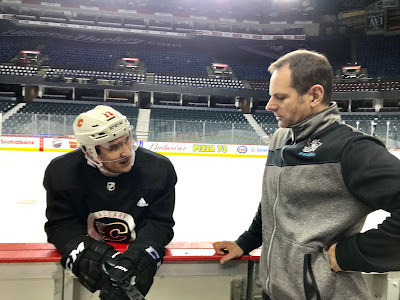 Prior to Friday's game in Calgary, it was awesome talking to Ryan Huska. The winningest coach in franchise history, Huska was pressed for time as the team was flying out to Minnesota after a morning skate at the 'Dome'. But typical Huska, after a quick chat on the bench he said, 'I will hurry up and shower" in an effort to do a quick interview with me. The personable coach delivered as Rockets athletic therapist Scott Hoyer stood closely by mocking my every question with a chuckle and Huska's answers. It felt like old times. It was fun, even if not for a few fleeting minutes. I have always loved the Rockets alumni. The older I get, the more I appreciate the players that I remember as teenagers and are now grown men. Speaking to Calgary Flames forward Mikael Backlund was a highlite. Again, he too was pressed for time but took a few minutes with me to catch up. Backlund and his wife are expecting their first child in May. Even the people you come across over your travels that you don't technically have verbal communication with make the road experience rewarding. Hitmen GM Jeff Chynoweth, one of my favourite personalities in the WHL, quickly swung by my broadcast booth while I was on the air. Jeff could have easily walked by, but didn't. I appreciate the handshake. Merry Christmas Jeff, if you read this drivel of a blog. Even the people you don't meet, yet their voice in the arena is familiar. Jim Duce is the longtime public address announcer for the Medicine Hat Tigers. I've never met the man, yet his voice has graced my airwaves for years when announcing goals and penalties at Tigers home games. It just sounds right. The road trips enabled me the opportunity to get to know Adam Foote better. I guess it works both ways as the new head coach has to deal with me on a daily basis. Trust takes time to build between broadcaster and coach and once that is achieved, the barriers come down. I've witnessed it first hand with every coach I've dealt with, from Marc Habscheid, Dan Lambert, Ryan Huska, Brad Ralph, Jason Smith and now Adam Foote. At the end of the day, I am not here to second guess them, but to support and cheer for them and the team they guide. The best hotel stay? We have four to pick from on this trip. Maybe its an unfair playing field, but the Delta Hotels by Marriott in downtown Calgary provided the best stay. Rated as a four star hotel, it truly delivers with rooms that have been recently renovated. The rain shower, the great beds, the massive flat screen TV and the inviting lobby, this hotel is a must stay. In my opinion it is now in a two-way horse race with the Edmonton Inn and Conference Centre as the best stay on the circuit. Yep, both now edge out the Crown Plaza in Portland. I again want to send a shout-out to our bus drivers on the trip. Greg Link again was the main man behind the wheel and did an excellent job of getting us from Cranbook to Lethbridge along snow covered roads. I even watched Link conduct a safety check of the bus before leaving the hotel in Medicine Hat. Link had his rubber mallet out, checking the tires. Small detail right? Link doesn't throw caution to the wind when it comes to safety. Impressive. Also, a high five to Mel Billings, who joined us in Calgary at 3 am in the morning to take over behind the wheel on our way home. Both Link and Billings are unsung hero's, but are valuable spokes in the wheel as we all attempt to do our job to the best of our abilities. No hockey until December 28th, eh? A little time away never hurts as we get set for the most exciting time of the season. The opening half saw as much change off the ice as on it. That likely will remain the theme before and after the WHL trade deadline January 10th. Enjoy the egg nog and Christmas tree and then strap yourself in for a crazy 33 games leading into the 2019 playoffs. Game Day Preview: Welcome to the halfway point of the season for the Kelowna Rockets. This is game #34. The Rockets play game three of four straight on a Central Division road trip. The Rockets are 1 and 1 after a 3-1 victory Tuesday over the Kootenay Ice before suffering a 5-1 loss in Lethbridge Wednesday night. In the game against the Ice, Leif Mattson scored twice on the power play in the two goal win. James Porter made 28 saves in the victory. Against the Hurricanes, Liam Kindree found the back of the net for his 7th goal of the season in the four goal loss. Roman Basran took the loss in goal. Of the four goals the team has scored on the trip, all four have come on the power play. Tonight’s game against the Hitmen is the lone meeting of the season between these two teams. The Rockets are 6-4-0-0 in their last 10 appearances at the ‘Dome’ including a 3-1 victory January 7, 2018. James Hilsendager was named the first star with a goal and an assist. The Rockets are in Medicine Hat tomorrow night to close out the first half of the season. The Rockets are 11-6-2-0 in 19 games under head coach Adam Foote. Who’s Hot: Nolan Foote had his 6 game point streak snapped Wednesday night. Foote had 3+5=8 over that stretch...Leif Mattson has 6 goals in his last 9 games. The 19 year-old has registered at least one shot on goal in 32 of the teams 33 games this season. Kyle Topping has registered a point in 24 of the teams 33 games this season. Topping had a five game point streak come to an end Wednesday. Topping had 2+5=7 over that period...In his last 6 appearances, goaltender James Porter has stopped 141 of the last 151 shots (.933 save percentage) he has faced. The Rockets penalty killing unit is 21 for 21 in their last five road games. Broadcasters Notebook: The Rockets face a former teammate tonight. Jake Kryski, now 20, is the Hitmen’s second leading point producer (14+19=33). Kryski played 37 games for the Rockets in the 2016-2017 season before being dealt to the Hitmen for Carsen Twarynski. Twarynski, a year older than Kryski, would score a career high 45 goals last season…The Rockets have the 9th fewest power play chances (125) in the WHL, yet are the fourth most penalized team behind only Seattle, Portland and Kamloops….Kyle Topping’s next goal will be the 50th of his career…Leif Mattson has 4-two goal games this season. Three of those four two goal games have come on the road…The team has added 15 year-old Jackson Desouza to the roster for this road trip. The fourth round WHL bantam pick in May is playing this season with the Okanagan Rockets of the BCMMHL…The Rockets have acquired the playing rights to 17 year-old forward Alex Swetlikoff from the Lethbridge Hurricanes for a 4th round bantam pick. Swetlikoff, a Kelowna product, was originally drafted in the third round by the Seattle Thunderbirds.…Lassi Thomson (Finland) and Libor Zabranski (Czech Republic) have been invited to the training camp for the upcoming World Junior Hockey Championships….The Rockets traded 19 year-old Jack Cowell to the Kootenay Ice November 29th for a third round bantam pick. The trade was voided when Cowell failed to report… The Rockets are 6-8-1-0 against BC Division teams this season….The Rockets have only one December birthday to celebrate. Lane Zablocki officially turns 20 on December 27th….Four members of the Kelowna Rockets have been named to NHL Central Scouting’s November “Players to Watch’ List. Forward Nolan Foote is an ‘A’ prospect, meaning a first round candidate. Kaedan Korczak is a ‘B’ prospect which means he is a second or third round candidate. Roman Basran/Lassi Thomson are ‘C’ prospects, which means he could be taken in the third to the seventh round…Adam Foote was officially named the new head coach of the Kelowna Rockets on October 23, 2018 replacing Jason Smith.,,The Rockets are 3-8-1-0 when playing the second game of back-to-backs. Did I call my last WHL game in Cranbrook? A win and a loss after two games. Could be better. Could be worse. To be frank, the results were expected. I anticipated a victory Tuesday night when the Kelowna Rockets opened a four game in five night Central Division road trip. In Cranbrook, the Rockets were fresh and were facing a team that hadn't tasted victory in 11 games. The Ice were susceptible and the visitors took full advantage. Facing a bottom feeder in the Eastern Conference, it was imperative to start the trip on a solid note and the team delivered by reaching the .500 mark for the first time this season. Leif Mattson scored twice on the power play and James Porter made 28 saves in the teams 15th win of the season. So winning in Kootenay was expected, but any fool knows that a night later picking up two points in Lethbridge wouldn't come easy. In my opinion, it was the toughest game of the trip. Lethbridge bolstered their roster November 29th when they picked up two of the Regina Pats best players. It only aids a team that has scored the 4th most goals in the WHL this season. With only three wins in the second game of back-to-backs, I thought the Rockets had a fighting chance if they were able to capitalize on the few scoring chances they would receive in the game. Why would the Rockets have so few scoring chances? It all comes down to puck possession and the Hurricanes have the puck a lot. I recall no less than three quality scoring chances when the game was close but the visitors came away empty handed. The best chance, that I can recall, was Lane Zablocki receiving a terrific pass on right wing and skating in and firing the puck on goal. Truth be told, the about to turn 20 year-old likely had more time to go to the backhand but elected to shoot with Hurricanes goaltender Carl Tetachuk making the save. When you are playing against an above average opponent, little mistakes are magnified. While surrendering the opening goal just over two minutes into the game, the back breaker was Hurricanes forward Jake Leschyshyn's shorthanded goal from just inside the blue line. It was a wicked wrist shot, but one from long range that Rockets goaltender Roman Basran would typically make. In this instance, the puck blew past him blocker side. It was a tough goal to surrender when the Hurricanes are able to manufacture quality chances on their own. In essence, it was a gift goal and put the Rockets in a tough spot down 2-0 after the opening 20 minutes. The Rockets had their chances to get back into the game with the power play. The problem is they often missed high and wide of the net. I get that the shooter is trying to score with pin point accuracy, but I find the percentages are low at this level to find the target. Why not dumb it down and fire it on net, let the goalie make the save and hunt down rebounds? A good example was the Rockets opening goal in Kootenay Tuesday night. Take the shot and then swarm the net. It is such and old technique that still has relevance today. On the first power play chance of the game, the Rockets ended up surrendering a shorthanded goal against. Ouch! Positives? For a fifth consecutive road game the team did not allow a power play goal against. The Hurricanes were 0 for 3 last night. In 17 road games, the team has surrender only 9 goals against. That is a whopping success rate of 89%. Only Prince Albert is better while shorthanded on the road. The Rockets have killed off 21 consecutive shorthanded situations. More positives? James Porter. I am not sure what is going on with him but I like it. The 18 year-old has been terrific. In his last 6 appearance he has stopped almost everything directed his way. Now owning a save percentage of .903, which to me is a far more impressive number than goals against average, Porter has allowed just 10 goals in his last 6 appearances. The coaching staff have been very hesitant in declaring a number one goaltender this season, so doesn't it only make sense to ride the guy with the hot hand? Right now that guy is James Porter. It will be interesting to see if he starts Friday in Calgary. I almost felt guilty on the air last night advocating for a fight. What is the biblical saying? Blessed be the peacemakers. I usually don't do that, but the Rockets needed some type of energy and life in the game. Well, Erik Gardiner delivered in the third period when :36 seconds into the face-off, with the score 3-0, the 19 year-old fought a much larger player in Lethbridge d-man Igor Merezhko. The 6'5, 225 pound blue liner rarely fights. Gardiner would fall into the same class, so why is he steeping up while others don't? On a team void of toughness, it really shows how much Gardiner cares. Mark Liwiski and Dalton Gally are arguably the best at dropping the gloves. What I saw last night from Gardiner was enough to say, yep, the 19 year-old is part of my leadership group. He isn't getting there because he produces points. Gardiner wears a letter because of his heart and soul. It was Gardiner's 5th fighting major of the season. Oh, the Saskatchewan product shouldn't be leading the team in penalty minutes, yet he is. So with a win and a loss in two games on this trip, while the team hasn't gained ground, they haven't lost ground to Victoria and Kamloops in the fight for second place in the BC Division. Face it, you can hand the Vancouver Giants the BC Division regular season banner at Christmas. They won't be caught. With a slim three point lead on Victoria and the faltering Kamloops Blazers five points behind with three games in hand, the situation is looking bright for a Rockets team that needs to finish strong with games in Calgary tomorrow and Medicine Hat on Saturday. Other quick notes. During my stop in Cranbrook, it was nice to touch base with 19 year-old Kootenay d-man Jonathan Smart. Always well spoken, Smart is now wearing an 'A' on his jersey as one of the older players on a team that boasts 11-17 year-old's on its roster. To think had Smart not asked for a trade out of Kelowna, where would he be today in his evolution as a player? At the time, the theory was a move out of Kelowna would allow the then 17 year-old to get more playing time in Regina. That appears to have backfire as the Pats eventually traded him to the Kootenay Ice. Sometimes waiting your turn and being patient as a younger player is indeed the best option. I was again impressed in my conversation with Kootenay head coach James Patrick. He reminds me a bit of Ryan Huska. Patrick is as engaging off the record as he is when a mic is put in front of his face. Speaking of engaging, I always like talking to Hurricanes GM Peter Anholt. There is just something about him. Is it his straight forward approach? Yet, he is also personable in any encounter I've had with him. He has a certain intensity about him too. It's weird, but I really like him. I think he is a great hockey mind. Need proof? Look at the trades he makes. All are calculated. Not without risk, all deals have a chance to backfire, but Anholt has the walnuts to pull the trigger. I admire that courage. I also think his interviewing skills are off the charts. 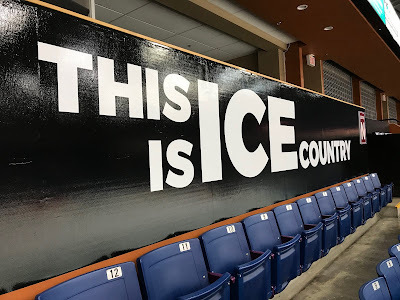 Will the Kootenay Ice be moving at season end? My guess is yes. I believe I've called my last game in a building where so many classic games went down. The rivalry between the Rockets and Ice from 2000 until 2005 were nothing short of amazing. Both franchises had terrific teams and the players that battled on the ice were world class. Who can forget Shea Weber crushing Nigel Dawes at centre ice at Prospera Place in one of several sensational playoff battles. I remember the hit followed by the late Ed Chynoweth, situated in the press box, jumping out of his seat, stomping over towards Rockets GM Bruce Hamilton and the two getting into a shouting match. Oh, emotions ran high back then. That's the reason those playoff battles were so intense and memorable. I haven't spoke much about my relationship with Adam Foote on this blog. What I can say is I really like him. He treats me very well. I am in awe at his work ethic, yet I am not surprised at the passion he brings to the rink or his will and want to win. Selfishly, I want Foote to be a good interview for you the fans and in my opinion he has delivered with insightful comments. The other day I wanted to interview him before the game and I joked that, 'the darn media are always getting in his way of his pre-game preparations'. Adam Foote gets it. It is part of the gig to make time for the media and to answer questions, not only the home broadcaster but the visiting media too. Hey, we all must remember we are in the entertainment business. The Lethbridge Hurricanes are using a large screen, the width of the arena on the one end where they are able to electronically advertise to the paying public. What I like most about that screen, is it enables the score-clock video monitor to be used, primarily, for just the action on the ice and replays. The team can still sell ads on the screen at the one end without detracting from the game itself. Love it. I could go on and on with other stories from the road, but I am boring you right? We will talk to you on the radio Friday (5;30 pm) from Calgary. Game Day Preview: The Kelowna Rockets open a four game road trip tonight against the Kootenay Ice. It is the lone meeting of the season between these two teams. These two organizations used to have classic playoff battles when the Ice played in the BC Division. These two franchises met in the Western Conference final in 2002, with the Ice winning in five games. It was so memorable because it marked the first time the Rockets franchise had been into the third round of the playoffs. In 2004, in the opening round, the Rockets eliminated the Ice in four straight. In the 2005 WCF, the Rockets eliminated the Ice in 6 games. In 2006, again in round one, the Rockets eliminated Kootenay in 6 games. That’s four playoff battles in the five seasons the Ice were in the BC Division before moving to the Central for the start of the 2006-2007 campaign. In the teams’ last appearance in Cranbrook, December 10, 2016, Jake Kryski scored twice in a 7-3 win. On January 31, 2015, Leon Draisaitl had 1+1 in the Rockets 5-1 victory. Overall the Rockets have won 3 straight in Cranbook, with their last loss coming February 22, 2011 in a 4-2 setback. Jordon Cooke faced 51 saves and was named the second star. The Rockets are 10-5-2-0 in 17 games under head coach Adam Foote. Who’s Hot: Nolan Foote has points in 8 of his last 9 games. Foote has 7+5=12 over that stretch. Leif Mattson has four goals in his last 7 games. The 19 year-old has registered at least one shot on goal in 30 of the teams 31 games this season. Kyle Topping has registered a point in 23 of the teams 31 games this season. In his last four appearances, goaltender James Porter has stopped 113 of the last 122 shots (.926 save percentage) he has faced. The Rockets penalty killing unit is 15 for 15 in their last three road games. Broadcasters Notebook: The Rockets made a change behind the bench Saturday, mutually agreeing to part ways with assistant coach Travis Crickard. Crickard joined the Rockets August 6, 2014, originally taking over from Kim Dillabaugh, who left the team to take a full time position with the NHL’s LA Kings…The Rockets have acquired the playing rights to 17 year-old forward Alex Swetlikoff from the Lethbridge Hurricanes for a 4th round bantam pick. Swetlikoff, a Kelowna product, was originally drafted in the third round by the Seattle Thunderbirds. This season, Swetlikoff, who is committed to playing NCAA hockey at the University of Denver…Lassi Thomson (Finland) and Libor Zabranski (Czech Republic) have been invited to the training camp for the upcoming World Junior Hockey Championships….The Rockets traded 19 year-old Jack Cowell to the Kootenay Ice November 29th for a third round bantam pick. The trade was voided when Cowell failed to report… The Rockets are 6-8-1-0 against BC Division teams this season….The Rockets have only one December birthday to celebrate. Lane Zablocki officially turns 20 on December 27th….Four members of the Kelowna Rockets have been named to NHL Central Scouting’s November “Players to Watch’ List. Forward Nolan Foote is an ‘A’ prospect, meaning a first round candidate. Kaedan Korczak is a ‘B’ prospect which means he is a second or third round candidate. Roman Basran/Lassi Thomson are ‘C’ prospects, which means he could be taken in the third to the seventh round…Adam Foote was officially named the new head coach of the Kelowna Rockets on October 23, 2018 replacing Jason Smith.,,The Rockets are 3-7-1-0 when playing the second game of back-to-backs. They don't ask how. They only ask how many. The Kelowna Rockets picked up their 14th win of the season last night in a 2-0 home ice victory over the visiting Victoria Royals. In likely the dullest game I've ever witnessed between the two BC Division rivals, the Rockets used a third period goal from former Royal Lane Zablocki and then an empty netter from Nolan Foote to hand Victoria its 11th loss in 16 games. More importantly, the Rockets moved four points up on both the Royals and Kamloops Blazers for second place in the BC Division, with both teams holding 6 and 5 games in hand respectively. While Roman Basran made only 16 saves for his second career shutout, the draft eligible goalie had to make two five alarm saves against Dante Hannoun in the first period and against Tyler Lees in the second. You can't argue with the results. Since a 7-0 shutout loss on November 16th, the team is 6-2-0-1 in their last 9 games. Players. Coaches. Take a bow. Both goaltenders were named stars in the game.While Basran was the first star, Royals netminder Griffen Outhouse was the second star. Outhouse was solid, but not spectacular in allowing his team a chance to win. I thought both teams struggled to execute. Passing was often off target and decision making was questionable. It almost looked like the final game before the Christmas break as neither team had much jump. Turnovers were common place in the defensive zone and both teams were seen icing the puck with regularity. In a game that featured little in the way of animosity, it came to a close in only 2 hours and 16 minutes. Just typical of how the night went, the game winner came from Lane Zablocki when his centering feed from behind the goal line went off Royals defenceman Mitchell Prowse and behind a startled Griffen Outhouse. It almost appeared that Prowse shot it into his own net. The obvious reaction is for Prowse to move the puck out of harms way when it hit his stick. Unfortunately the veteran d-man flipped the puck into his own goal. Speaking of Outhouse, the 20 year-old goalie returned to the lineup after missing three games with injury. Outhouse looked no worse for wear. The Royals also had 20 year-old Ralph Jarratt back in the lineup after missing 11 games. Those two need to be mainstays for the Royals to have any chance of winning. Without those two overagers, Victoria is average at best. When I speak of average...I am pointing to teams that are playing near or at the .500 mark. More than a handful full of teams fall into that category, including the .484 winning Kelowna Rockets. The hope is all teams can be above average after the Christmas break in an effort to make a good push for a playoff spot. The Royals were the biggest surprise this season in the BC Division when they opened with 7 straight wins. I had to only look at their schedule to find out how a team, that had lost so much fire power from last season, was winning hockey games. To be frank, the Royals schedule was not only lite to start the season, but the majority of games were on home ice against inferior competition. The Royals opening eight games were all against BC Division rivals, where four out of the five teams, outside of Vancouver, are expected to tetter around the .500 mark this season. The good news? The Rockets took only three minors in a game that featured no off-setting penalties for aggressive play. It was so friendly that even Dante Hannoun taped Roman Basran on the pads after making his goal saving stop on the 20 year-old when the game was scoreless. Hey, Christmas is the season for love right? Remember how bad the Rockets were on home ice to start the season? The team is now 7-1-1-0 in their last 9 games at Prospera Place. They opened the season with 6 straight losses at home. The Rockets now get set for a four game road trip through the Central Division. It all starts Tuesday in Cranbrook against the Kootenay Ice. It is a gettable game to open the road trip considering the Ice have just 7 wins in 32 games and the possible news that the team is relocating to Winnipeg at seasons end. The key factor for this years edition of the Kelowna Rockets is to not play down to the level of the opposition. You can't leave these two point on the table to a team that woke up Saturday morning without a regulation win in their last 10 games. The Rockets have a rare Saturday night off. How rare? It is the first Saturday off in 12 weeks. For those wondering, the team has played 31 games over 71 days, so having Saturday and Sunday off is a welcome reprieve. Only Kootenay (32) have played more games than the Rockets. I will make sure to do some video for you during our road trip out East. I will post it on my Twitter feed. We will talk to the players about Christmas and share some other shenanigans they may be up too. While the trip is all business, with wins paramount, we need to have some fun too don't we? Talk to you in Cranbrook! Game Day Preview: This is the final home game for the Kelowna Rockets before the Christmas break. The Rockets host the Victoria Royals to wrap up a three game home stand. The Rockets have an overtime loss (5-4) to the Saskatoon Blades and a shootout win over the Tri City Americans (3-2) over that period. This is the fifth meeting of the season between these two teams. The Rockets are 3-1-0-0 in the seasonal series, including a 3-1 victory at Prospera Place back on November 23rd. The Rockets have won the last three meetings after dropping a 4-3 decision on home ice back on October 5th. The Rockets power play is 6 for 16 (37.5%) in the opening four games against Victoria. Liam Kindree has 4+5=9 against the Royals while Lassi Thomson has 3+4=7 against the BC Division rivals. Roman Basran has a sparkling 3-0-0-0 record and a goals against average of 1.33. The Rockets are in Cranbrook this Tuesday to open a four game road trip. The Rockets are 9-5-2-0 in 16 games under head coach Adam Foote. Who’s Hot: Nolan Foote has points in 7 of his last 8 games. Foote has 6+5=11 over that stretch. Leif Mattson has four goals in his last 6 games. The 19 year-old has registered at least one shot on goal in 29 of the teams 30 games this season. Kyle Topping has 3 goals in his last 6 games. Topping has registered a point in 22 of the teams 30 games this season. In his last four appearances, goaltender James Porter has stopped 113 of the last 122 shots (.926 save percentage) he has faced. The Rockets penalty killing unit is 15 for 15 in their last three road games. Broadcasters Notebook: The Rockets have acquired the playing rights to 17 year-old forward Alex Swetlikoff from the Lethbridge Hurricanes for a 4th round bantam pick. Swetlikoff, a Kelowna product, was originally drafted in the third round by the Seattle Thunderbirds. This season, Swetlikoff, who is committed to playing NCAA hockey at the University of Denver…Lassi Thomson has been invited to Team Finland’s training camp for the upcoming World Junior Hockey Championships….Libor Zabransky has been invited to Team Czech Republic’s training camp as well…...The Rockets traded 19 year-old Jack Cowell to the Kootenay Ice November 29th for a third round bantam pick… The Rockets are 5-8-1-0 against BC Division teams this season…Nolan Foote has scored 9 home goals and 8 road goals this season …7 of Kyle Topping’s 12 goals have come on the road…16 of Topping’s team leading 31 points have come on the road….The Rockets have only one December birthday to celebrate. Lane Zablocki officially turns 20 on December 27th….Four members of the Kelowna Rockets have been named to NHL Central Scouting’s November “Players to Watch’ List. Forward Nolan Foote is an ‘A’ prospect, meaning a first round candidate. Kaedan Korczak is a ‘B’ prospect which means he is a second or third round candidate. Roman Basran/Lassi Thomson are ‘C’ prospects, which means he could be taken in the third to the seventh round…Adam Foote was officially named the new head coach of the Kelowna Rockets on October 23, 2018 replacing Jason Smith.,,.The Rockets are 3-7-1-0 when playing the second game of back-to-backs. Game Day Preview: This is the second to last home game before the Christmas break. The Rockets host Victoria Friday before heading out on the road for four consecutive games to wrap up the opening half of the season. The Rockets host the Tri City Americans tonight in the fourth and finally meeting of the season between these two playoff rivals. The Rockets are 2-1-0-0, with all three games decided by a single goal. The road team has won all three games; including the Rockets 3-2 overtime win last Friday at Toyota Center. The Americans beat the Rockets at Prospera Place (5-4) back on October 13th. Leif Mattson, Kaedan Korczak and Kyle Topping lead the Rockets offensively in the three games with four points apiece. Mattson and rookie Dallon Wilton lead the team in goals with two each against the Am’s. The Rockets are 8-5-2-0 in 15 games under head coach Adam Foote. Who’s Hot: Nolan Foote has points in 6 of his last 7 games. Foote has 5+4=9 over that stretch. Leif Mattson has four goals in his last 5 games. The 19 year-old has registered at least one shot on goal in 28 of the teams 29 games this season. Kyle Topping has 3 goals in his last 5 games. Topping has registered a point in 21 of the teams 29 games this season. In his last three appearances, goaltender James Porter has stopped 85 of the last 91 shots (.934 save percentage) he has faced. The Rockets penalty killing unit is 15 for 15 in their last three road games. Broadcasters Notebook: Lassi Thomson has been invited to Team Finland’s training camp for the upcoming World Junior Hockey Championships….Libor Zabransky has been invited to Team Czech Republic’s training camp as well…...The Rockets traded 19 year-old Jack Cowell to the Kootenay Ice November 29th for a third round bantam pick… The Rockets are 5-8-1-0 against BC Division teams this season…Nolan Foote has scored 8 home goals and 8 road goals this season …7 of Kyle Topping’s 12 goals have come on the road…16 of Topping’s team leading 31 points have come on the road….The Rockets have only one December birthday to celebrate. Lane Zablocki officially turns 20 on December 27th….Four members of the Kelowna Rockets have been named to NHL Central Scouting’s November “Players to Watch’ List. Forward Nolan Foote is an ‘A’ prospect, meaning a first round candidate. Kaedan Korczak is a ‘B’ prospect which means he is a second or third round candidate. Roman Basran/Lassi Thomson are ‘C’ prospects, which means he could be taken in the third to the seventh round…Adam Foote was officially named the new head coach of the Kelowna Rockets on October 23, 2018 replacing Jason Smith.,,.The Rockets are 3-7-1-0 when playing the second game of back-to-backs….The opposition has opened the scoring in three straight games…The Rockets have scored 38 goals on home ice, or 2.92 goals per game…Last season after 13 home games the team had scored 57 goals or 4.4 goals per game. Half cup full or half cup empty? I will take half cup full please! How can you not walk away from last night's Kelowna Rockets 5-4 overtime loss to the Saskatoon Blades without yelling out like Russell Crowe did in the movie Gladiator, "Are you not entertained"? In a terrific game played at Prospera Place, the Rockets rallied from a third period 4-2 deficit to tie the score before losing in overtime. Down 3-1 heading into the final 20 minutes, the Rockets received goals from Leif Mattson, Braydyn Chizen and Kyle Topping and earned a point when it looked like the home team would come away empty handed. Sure, the game was not without a flawless performance, nor can we expect it to be with a team that sits precariously in second place in the BC Division with 29 games already under its belt. For two teams feeling fatigue, with the Rockets playing the previous night in Tri City and the Blades ending a BC Division road trip, the fans were treated to a beauty. The pace of the game was really terrific. I will go out on a limb and suggest it was one, if not the fastest game I've seen the Rockets play this season. Yep, the Rockets matched the pace, which honestly surprised me in a game that featured several glorious scoring chances at both ends. I don't think Adam Foote liked the way it was going on the Rockets bench. Mitch Love would likely agree that it was way too wide open, but coaches, can we just back off for just a second and enjoy the game for what it was? In a season where so many games are hum-drum with an emphasis on defensive hockey, this was a 180 shift from what coaches typically like and the 51 hundred fans enjoyed it. The game winning goal came from Blades d-man Dawson Davidson, who went in a breakaway and beat James Porter between the legs. The scoring chance came courtesy of Kaedan Korczak gambling by attempting to take a pass in close on Blades goaltender Nolan Maier. The pass is intercepted and Davidson is sent up ice with nothing but the Rockets net in front of him. If the pass does get through from Leif Mattson to Korczak, it is likely game over and it looks like a terrific play. Sure, it backfired. That said, I rather see the team be aggressive in overtime and wanting to win rather than playing with the fear of losing. I know the coaches will think otherwise, but I'm a fan of the game, not a coach. Rookie Mark Liwiski scored the 'Teddy Bear Toss Goal'. The rookie forwards chip shot on a point blast from d-man Devin Steffler made it a 3-1 score. It was Liwiski's second goal of the season for a forward who does his best work by getting involved physically. The Teddy Bear's came raining down from the crowd, and after a short 8 minute clean up, we were back to the action. I really liked the play of 16 year-old Ethan Ernst last night. Collecting an assist on Chizen's blast from the blue-line, Ernst is gaining more confidence and it is clearly evident. I thought he had some excellent shifts against a quick skating team and didn't look out of place. When Lane Zablocki plays with pace, it's amazing what he can accomplish. His move off the half wall in setting up Kyle Topping for the tying goal late in the third period was a perfect example of how he needs to use his speed and determination to set up a teammate. I also liked Liam Kindree's dipsy doodle move off the boards for a glorious scoring chance in the second period. I have never seen Kindree do that. I will have seconds of that please! Korczak, Libor Zabransky and Erik Gardiner all celebrated 100 games milestones last night. Gardiner hit 100 games in the WHL earlier this month, but this was his 100th with the Rockets. In the first intermission, colour analyst Kent Simpson had Blades GM Colin Priestner on the airwaves for a live interview. Simpson took the interview in the direction I love....talking to Priestner about his singing career and the fact he was a top ranked junior tennis player and competed in NCAA at Illinois University. Great line of questioning. It was also nice to chat with Blades HC Mitch Love before the game. I'm a fan I will admit. Always engaging, I've talked to Mitch many times over the years when he was a player and then assistant coach in Everett. He is a guy you cheer for because of his dedication to the craft of coaching. Love won't turn the fortunes around of the Blades in one season, but his stamp is clearly evident on a team that has missed the playoffs in five straight seasons. In 2018-2019, the team is good enough to be prancing and dancing in post season for the first time since 2012-2013. In a tie with Victoria for second place in the BC Division, the game Friday against them is extremely large considering the Royals have played 7 fewer games. That is 14 points that the Royals have in the bank, if they run the table and win all seven. Despite the discrepancy in games played, it's better to be in second place than in the basement where the team has spent far too much time looking above them, not below them in the standings.